In any gathering, I'm almost always the one you'd find telling stories and making people laugh. It's not because I'm an attention whore (contrary to popular belief) but because I just want to make sure that everyone in that party or gathering is comfortable and having a good time. I am an open book when it comes to my life. I tend to share but what people don't know is that I may share a lot but I don't really share the things that matter so much to me. I share only what I want to share. I share what I can share. I share what they want to hear. Sometimes though ... 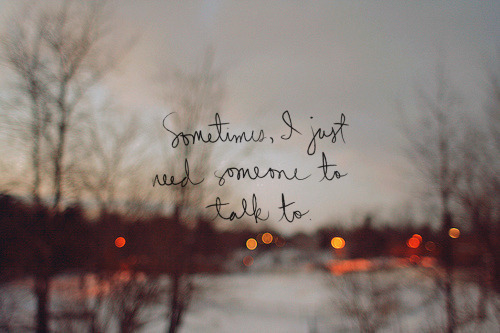 I wish that I have someone I can just talk to ... in person. I already have someone whom I can talk to on the phone and to this person, I am very grateful but its different if you see the person and hang out while lamenting. Me too. I tend to keep things bottled up inside of me. I hope you feel better soon. What a timely post. I'm feeling the same right now. I remember your suicide attempt in the past. Sometimes, I think I feel like just giving up, but I don't have the guts to kill myself.